The Nineteenth Century saw many technological changes, but none of them were to have as wide repurcussions as the invention of the train. The power of steam had been known for some time but applying this power to moving heavy goods and people over long distances was one application that would have profound consequences and serve the British and their Empire for well over a hundred years. It was George Stephenson who realised the full power and potential of the steam engine when he designed a machine that could take advantage of narrow copper tubes which could be heated to create the all important steam power. The Rocket was the first such steam engine to take advantage of this new technology as it operated between Liverpool and Manchester from 1830. However, technical change was to become rapid and the train was to change its appearance and technical specifications again and again. Inevitably, it was the mother country that first saw her landscape transformed by this new invention. Navvies from Ireland, Scotland and the North of England scarred the landscape with viaducts, bridges and tunnels in the pursuit of the smooth gradients that trains required to travel at their most efficient level. They were paid a pittance for excruciating and dangerous work. In many ways, these navvies represented one of the largest migrations of Imperial settlers as they moved over from Ireland or as they followed the train tracks around the country and ended up settling in the last place they found work. In 1847 there were a quarter of a million navvies digging and blasting their way over the British landscape, their travels are one of the lesser documented migrations of history. However, the job they did is still plain to see in the British landscape some 150 years later and will be for many more years to come. The amount of track laid in Britain increased from only 500 miles in 1838 to over 8,000 by 1855. This expansion of track also brought down the cost of travel so that all but the poorest could afford to travel by train. In the stagecoach days, a ticket from London to Manchester and back would have cost '3 10s but by 1851 the train fare for this same journey was only 5s (a fourteenth of the stagecoach fare) for a far quicker and more comfortable journey. Of course, the expansion of the railways didn't just rest on the invention of the steam train. 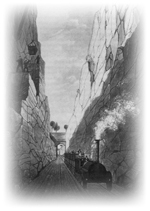 Iron was needed for the rails and its mass production helped to reduce the costs to the railway industry. In addition, iron girders and glass were used to construct magnificent looking railway stations. Even older industries, like stonemasonry were given a new lease of life as vast quantities of stone and rock were needed for sleepers, bridges and stations. The railway age was an enormous boost to the economy of Britain, and would provide the country with one of the most efficient infrastructures for the remainder of the century. It wouldn't take colonial administrators long to see the benefits that such an infrastructure could bring to the colonies they were in charge of. Particularly, as some of these colonies could be immense in size and with little existing infrastructure. Horses and ships had provided the most efficient means of transport to date, but ships obviously couldn't reach the interior and horses could not match the speed and power of this latest invention. The old established colonies like India, leapt at the railway opportunities and built a railway structure that would even rival the mother country's in scope and scale. They were often financed by British industrialists keen to move the primary products of India to the ports ready to be exported to Britain and her factories. Cotton, spices and teas would all provide the economic model for railway building that would later be copied in other colonies by other crops and industries; rubber in Malaysia, coffee in South America, grains in Canada and livestock in Australia and New Zealand. In some colonies, railways were used more as the initial spur to encourage colonisation of an area. In Africa, railways were built to provide an infrastructure that would lure white colonists into an area in order to farm it and turn it into a profitable colony. South Africa, Rhodesia and Kenya all wanted to increase their white population and increase the economic activity of their lands and all spent copious amounts of money and effort into building railways in what were very often inhospitable areas to European settlers. They all had varying degrees of success, but they were built nonetheless. Indeed, one of the burning issues of late Nineteenth Century was Cecil Rhodes' ambition to build a Cape to Cairo railway line that passed through British territory all the way through the continent. And this dream, although not realised by a train network, certainly influenced a great deal of Central African colonisation during the period. Another spur to the railway building in the Nineteenth Century was the British army. They too, quickly identified the advantages in being able to move troops and supplies around in a quick and efficient manner. The army would often try to influence local colonial administrators and get them to build railway lines to places which had little business or economic rationale. Alternatively, the army would build its own railway lines in areas they felt were necessary. In the case of Kitchener's Sudan campaign in the late 1890's, the army travelled down the Nile slowly but surely, not just out of tactical considerations, but because they were building a railway line as they travelled. In fact, this railway line is still in use as Sudan's major railway line over a hundred years after it was built by the British army. Likewise in the Boer war, the British army came to depend on the strategic advantages of the railway network, but would also be exposed to the vulnerability of this network as the Boers transformed themselves into a guerilla army and destroyed bridges and lines at will. Despite this costly lesson, the British army maintained its respect and use of trains for many more years to come. Railways transformed the Empire in many ways, it increased business activity and allowed businesses to flourish in areas that previously would have been impossible to make a living in. It allowed officials to move rapidly over the areas that they governed. It allowed troops to be dispatched over great distances in short periods of time, indeed this speed of response removed much of the burden of having to station so many troops in a colony in the first place. Populations could benefit from access to cheaper goods as the factories of Europe could unleash their products to the far flung corners of the empire: tinned goods, newspapers, boot polish and toys could all be moved at a fraction of the cost from previous days. The people themselves could move around the empire whether for business or for pleasure; families could be reunited more regularly, farmers could travel longer distances to get their products to market, businessmen could entertain clients from further afield. Even within relatively short distances and in crowded areas people wanted to enjoy the benefits of the train system. Therefore, in London, one of the more interesting railway innovations was devised in the 1860's; the underground system, or the tube. Using Victorian ingenuity and technical engineering expertise an elaborate underground system of trains was built that would be envied and copied by Metropolises the world over. And again, it reinvigorated the economic life of the City of London and allowed for yet another relocation of businesses and housing for the masses of that city. 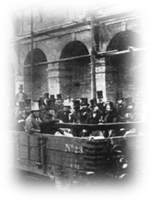 The advantages of the railways were apparent to virtually everyone. These were the days when progress was seen as a universal good and the railways were a prime example of this beneficent progress. Don Owens gives a brief overview of the development of railway infrastructure in East Africa and his experiences working on the trains there and dealing with unique problems such as a rhino charging a moving locomotive. J. Y. Vatikiotis, who used to work on the Palestine Railway, explains just how quickly and extensively the British modernized the railway and port network of their Palestine Mandate in the 1930s and 1940s helping to enable the colony to become one of the most profitable in the Empire.